(Nanowerk News) The spread of antimicrobial resistance with the emergence of 'super-bugs' that resist even 'last-resort' antibiotics has prompted the World Health Organisation (WHO) to formally tackle the problem of an unwanted post-antibiotic era. Antibiotics are chemicals that are selectively toxic to bacteria. Resistant bacteria can break down antibiotics to make them less toxic or alter the sites to which they bind to divert antibacterial action. In this light, it is becoming clear that reaching a subtle balance between antibiotics and infections is a long and perhaps never-ending journey which necessitates the search for alternative approaches. Transplant medicine, wound healing and graft surgery have particularly strict requirements for infection-free cell and tissue growth. Encouragingly, approaches in support of this are not limited to the use of antibiotics. A notable solution is provided by an unlikely source - the cicada. The wings of this small fly display bactericidal nanoscale pillar structures. Each of these pillars is a pike of several tens of nanometers in diameter and is separated from other pikes at regular nanometer intervals. Densely packed on the wing surfaces, these pillars arrange into nanopatterns which pierce the membranes of bacterial cells on contact, tearing bacteria apart. 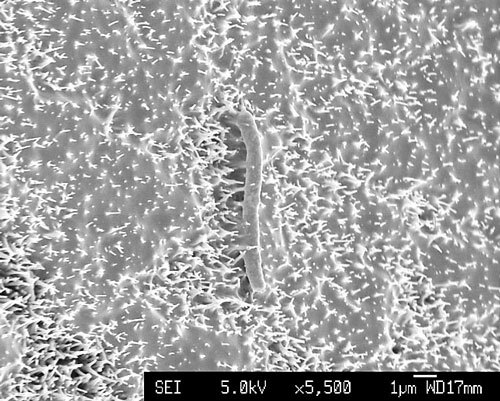 Inspired by this example, a research team from NPL and the School of Oral and Dental Sciences at the University of Bristol engineered biocompatible surfaces exhibiting nanowire arrays. Each of these nanowires, in a similar fashion to the cicada's nanopillars, acts as a tiny spear that pierces bacterial cells causing their leakage and death. Remarkably, however, and unlike cicada wings, these substrates are also capable of guiding human cells to grow and multiply. Ting Diu, a PhD student who worked on the project, published in NPG's Scientific Reports this month ("Cicada-inspired cell-instructive nanopatterned arrays"), said: "Biocompatible materials lack surface cues that can guide cells in a specific manner. The surfaces we engineered act as self-decontaminating shields that can sort out human cells, which they support, from bacteria, which they resist. Because of these properties our rationale can be adapted for a variety of biomedical implants, anti-fouling surfaces or biosensors." The introduced concept holds promise for clinically relevant materials by offering a physical rationale for anti-microbial action. In marked contrast to the biochemical mechanisms of antibiotics, which are subject to acquired resistance, physical mechanisms are non-specific, and cannot be reversed or altered, tackling bacterial cells as a whole.